Elation Professional has expanded its Platinum Series of high-powered, energy-efficient moving heads with the launch of the Platinum Wash 16R Pro, a low wattage yet high-output moving head luminaire that can be flexibly used as either a beam or wash luminaire. Like all Elation Platinum Series fixtures, the Platinum Wash 16R Pro is extremely energy-efficient relative to its output. It uses the new Platinum MSD 16R lamp from Philips (330W, 16,000 lumens) yet delivers an output comparable to 700W and even 1000W wash discharge fixtures for substantial energy savings. Combine that with a high-quality optical system and the Platinum Wash 16R Pro is ideal for a wide variety of professional stage and touring applications. A motorized zoom system offering a variable range 3°-14° beam and 6°-43° wash is capable of adjusting the beam from very tight and narrow to a wide wash for flexible dual use from a single luminaire. For more precise illumination, the fixture includes an internal rotating beam shaper that allows for alignment of the beam for easier coverage of scenery and set pieces. A CMY colour mixing system gives a full spectrum of colour options with additional colors available from a 6-slot color wheel, including UV and CTO correction. A host of other effects and beam manipulation can be achieved via the fixture’s two separate frost filters (light + heavy frost), linear rotating prism with macros, shutter and 0-100% dimmer. 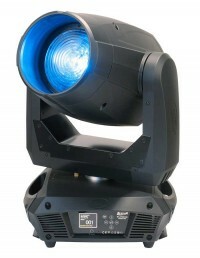 The Platinum Wash 16R Pro includes a host of standard features that make a lighting professional’s life easier like 3-pin and 5-pin DMX connections, PowerCon In, and a universal auto-switch power supply. It also includes a built-in EWDMX wireless DMX receiver that allows the fixture to receive DMX signals wirelessly from up to 3,000’ when used with an Elation EWDMX transmitter. The Platinum Wash 16R Pro is naturally industry standard DMX-512 controllable and a 6-button touch control panel with full-color 180° reversible menu display makes it easy to navigate through DMX and manual settings. The Platinum Wash 16R Pro is also RDM (Remote Device Management) ready for easier configuration and monitoring of DMX based systems, and like all Elation luminaires the fixture is covered by Elation’s 2 Year Warranty and Total Support.